The project ‘Strategies for a Sustainable Urban Mobility’ (‘Stadtverträgliche Mobilität – Handlungsstrategien für eine ökologisch und sozial verträgliche, ökonomisch effiziente Verkehrsentwicklung in Stadtregionen’) is a good example of successful integration work. Researchers from a number of different disciplines, as well as planners from two model cities, formed the research group CITY:mobil and cooperated within this project to develop innovative research methods, on the one hand, and planning tools aimed at a more sustainable mobility in cities, on the other. The project was designed to integrate planning and technical aspects as well as economic, ecological and social goals. Thus, the rather complex task of knowledge integration and social integration by the project team was one of the central challenges within the research process. 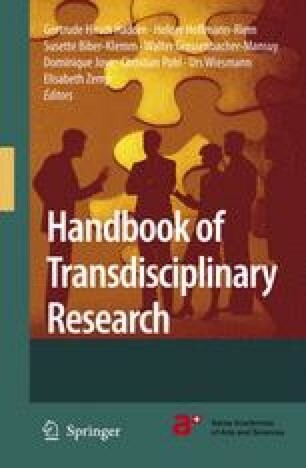 Therefore, after introducing the details of this specific research project, we conclude with a universal model for a transdisciplinary research process. This model can support researchers in planning and conducting the complex integration demands to meet the dual targets of integrated research results for the area of interest (i.e. the societal problems being the starting point of the research project), and of new interdisciplinary or disciplinary results (e.g. methods, concepts and theories).